Through this route, visitors travel back eight centuries, the time when the Arabs ruled Hellin. 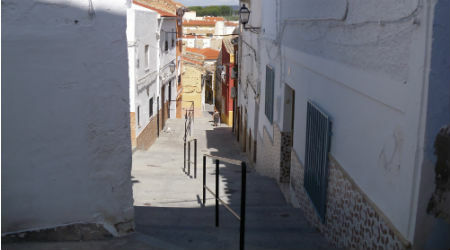 You can see the strong Islamic imprint on the urban and architectural fabric of the old town through narrow streets and squares, of homes in the old town and the few remains of the Castle Almohad. The tour begins in Asuncion Street, under the Arc de Salvador, since this is the area that marked the border between the old, declared Property of Cultural Interest 2007, Hellin and widening that took place between the seventeenth and eighteenth centuries. Continuing up the stairs to the street Rosary we enter the Cerro del Castillo, where originated the modern city after he left the Tolman Minateda around the ninth century. In the middle of the street, you can see remnants of the walls of the ancient fortress and were reused as back walls of some houses. 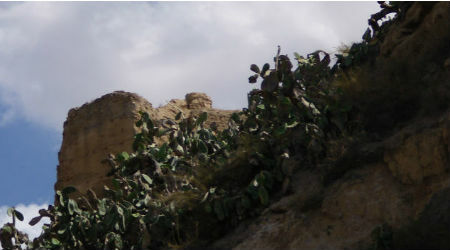 At the end of this street, we reached the highest point on the course and in which stood at Almohad Castle of Hellin. It was built between the eleventh and twelfth centuries, and was a polygonal enclosure with quadrangular towers where it is possible to recognize several towers and town walls. It was a fortress that served as a lookout and temporary shelter to the inhabitants before the expected arrival of enemies. Nowadays there are few traces because of disruption that has suffered from the fifteenth century and reuse as prison, quarry, magazine or water tank. Taking down the street that leads to Salvador, you can see the place names referring to the different parts that comprise the Castle, as streets Belt and Pit. Continuing along the street door Alcaraz, find a free wall and tower known as overtaking mode torre Albarrana, whose function would be to collect water from the north of the city and spread among the population. If we continue walking, Well after touring the streets of Dogs and Pichon, reach one of the most remarkable landmark of historic, Street Plaza Animas. 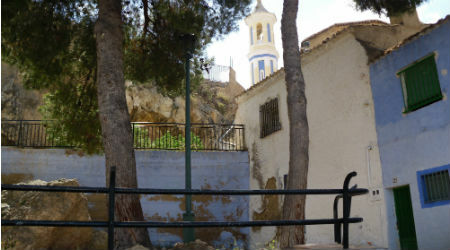 From this area, Fall Peña called due to constant rockfalls, you can see the remains of the main tower of the castle besides the apse of the Chapel of the Rosary. Looking back on our steps, take the streets Post where you can observe the homes historic features. It is humble homes, one or two plants, which are often painted in white and blue and they used to have courtyards dedicated to animal husbandry. Finally, after crossing the street Barrio Nuevo, name because it was one of the first to break the siege of the castle walled, arrive at Beso Alley. 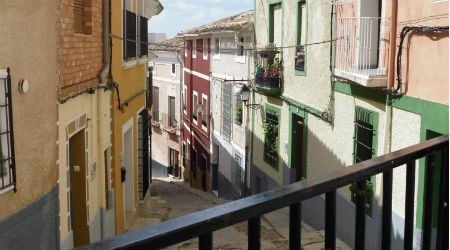 This is the narrowest street in the entire city, whose name appears to date from the Muslim period, and which highlights housing Mascuñán between numbers 3 and 7. The historical significance of this house resides in the fact that Charles I stayed in it in the year 1541. Following this route, visitors will be aware of the profound impact the Islamic world marked by both the architecture and the urban fabric of the historic town of Hellin.